The Bristol Wrestling Club is going back to our roots. In 2006, the Vikings Wrestling Club was formed to provide an exceptional youth wrestling experience in Bristol. In 2014, VWC joined forces with Battle-Cats to form Bristol Wrestling Club. We have had six great years at BWC, but we have decided its time to bring back the Vikings! 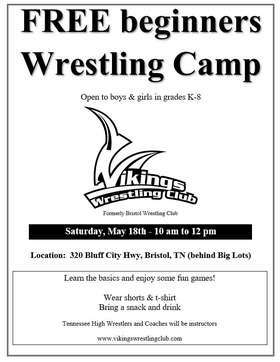 Going forward our club will once again be known at the Vikings Wrestling Club.The club is still open to any wrestler in Bristol or surrounding areas, regardless of the school attended.